There are approximately 3,600 hot mix asphalt plants in the United States, accounting for a total annual production of 400 to 450 million metric tons (450 to 500 million tons) of asphalt paving material. About 2,300 of these hot mix plants are batch plants, with the remaining 1,300 being drum mix plants. Roughly 40 to 50 percent of all hot mix asphalt plants are equipped with baghouse collections systems. Baghouses consist of several rows or compartments of fabric filters that collect the dust during the operation of a hot mix asphalt plant. Most of these systems are preceded by cyclones, which are primary collection devices used to capture the coarser particles emitted from the plant's dryer. Hot mix plants that do not have baghouse collection systems are equipped with wet scrubbers to control air emissions. Drum mix and batch plants differ in their asphalt concrete production operations. In drum mix plants presized cold aggregates are fed into a drum, in accordance with preselected mix design proportions. The aggregates are dried and mixed with asphalt cement, which is introduced at the end of the drum (coating zone), in a continuous process. In batch plants unsorted aggregates are introduced into a dryer and subsequently screened into different size fractions, stored (in hot bins), and fed, by batch weight, into a separate pugmill mixer where the hot aggregates are mixed with asphalt cement. Simplified line diagrams of batch and drum mix plant operations are presented in Figure 1. Baghouse fines collected in the baghouse may be routed directly to the asphalt production facility or stored in a silo for subsequent use as a mineral filler additive in the mix. Figure 1. Batch plant and drum mix plant operations. Although most of the baghouse fines are returned to the asphalt mixing plant, some producers (probably less than 10 percent) with excess dust dispose of the dust by sluicing it to a settling pond or returning it to the quarry. (2) Where wet scrubbers are employed for dust control instead of baghouses, the washed fines are generally discarded. The only established use for baghouse fines or dust is the return of the dust into an asphalt paving mixture as a portion of or, in some cases, all of the mineral filler. Mineral fillers can constitute up to 5 percent of some asphalt pavements. Other relevant physical properties of baghouse fines are specific gravity, specific surface, hygroscopic moisture, and Atterberg limits. Table 1 summarizes the observed range of values for the physical properties of baghouse fines. With few exceptions, baghouse fines normally absorb less than 2 percent moisture at 50 percent relative humidity. Baghouse fines contain little or no clay and will generally have little or no trouble meeting the plasticity requirement for mineral filler, which limits the plasticity index value to 4.0. With few exceptions, the pH of baghouse fines is alkaline, with values ordinarily ranging from 7.2 to 10.8 for dusts from gravel, granite, or traprock aggregates and values ranging from 11.0 to 12.4 for dusts from limestone and dolomite aggregates. The chemical properties of baghouse dust can be expected to reflect the properties of the feed aggregate. Table 1. Typical range of physical properties of baghouse dusts. 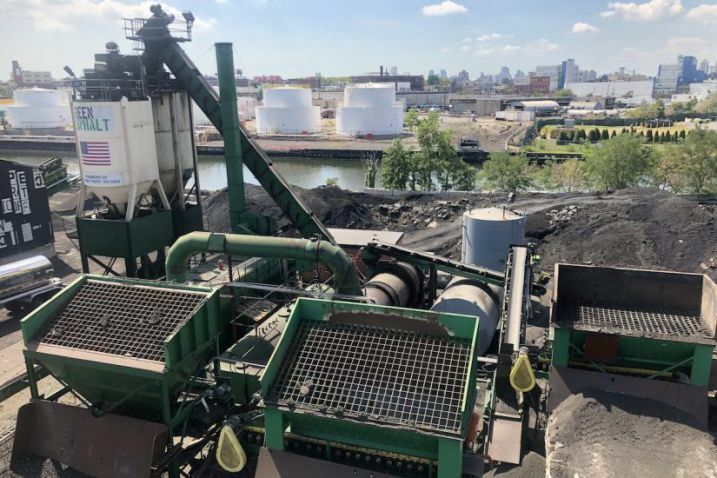 Baghouse fines from dust collection devices at asphalt mixing plants are routinely recycled as all or part of the mineral filler portion in hot mix asphalt paving mixtures. Since these fines are derived from naturally occurring aggregates (crushed stone or sand and gravel), their properties are ordinarily quite similar to those of commonly used mineral fillers, such as stone dust or hydrated lime. Baghouse fines from a particular plant and aggregate type should only be used at that plant and with the aggregate type from which it was derived, since baghouse fines from different aggregates vary in gradation, chemical composition, and affinity for asphalt. A number of state transportation agencies and/or trade associations have also investigated the use of baghouse dust or baghouse fines as a mineral filler in asphalt mixtures. Many of these studies were laboratory investigations that focused on the variability of baghouse dust and the effect of such variability on mixture behavior. Baghouse dust from the primary collection system (cyclone), if present, is generally returned to the hot elevator. Baghouse dust from the baghouse hopper can be returned to the hot elevator, the No. 1 hot bin, or the weigh box. In either case, the dust is dry and further processing is unnecessary. Some of the properties of baghouse fines that are of particular interest when baghouse fines are used as mineral filler in asphalt pavements include gradation, organic impurities, and plasticity index. Mineral filler requirements, which address these properties, are specified in American Association of State Highway and Transportation Officials (AASHTO) M17(6) and are shown in Table 2. Table 2. AASHTO M17-83 specification requirements for mineral filler for use in bituminous paving mixtures. The properties of the asphalt concrete that could be affected by baghouse dust include cement penetration and viscosity, stability, resilient modulus, and moisture sensitivity. Penetration and Viscosity: Previous studies indicate that an increase in the fines/asphalt ratio (from 0.2 to 0.5 by volume) can be expected to result in an almost linear decrease in the penetration value of the resultant asphalt binder material. (7) The viscosity of fines/asphalt blends can be expected to increase or stiffen as the fines/asphalt ratio is increased. 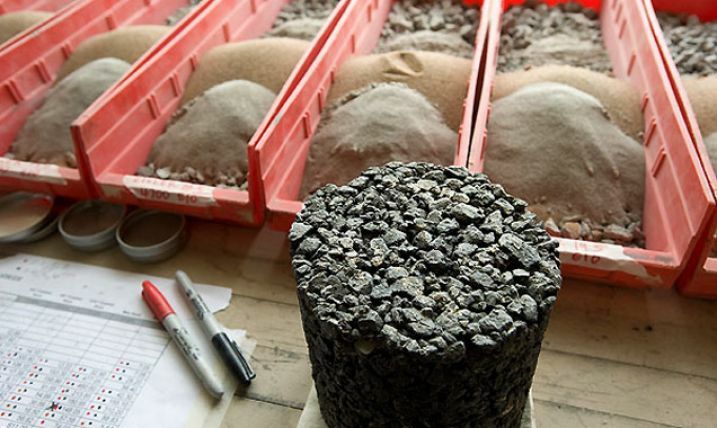 Asphalt mixes containing baghouse fines can be designed using standard laboratory procedures. Conventional AASHTO pavement structural design methods are appropriate for asphalt pavements containing baghouse fines. Baghouse dust can be fed directly from the baghouse into the plant mix or stored in a silo prior to use. The location where the baghouse fines are to be added to the plant mix depends on whether the plant is a batch mixing plant or a drum mix plant. In many cases, baghouse dust may be only a part of the mineral filler component of the mixture. The same methods and equipment used to mix, place, and compact conventional asphalt paving mixes are applicable for baghouse fines. However, if the filler/asphalt ratio with baghouse fines is too high, a stiffer mix may result and the specified level of compaction may be difficult to obtain. Inadequate compaction appears to be more of a problem when very fine baghouse fines are used as filler. There are wide variations in the stiffening effects of baghouse fines, which are not fully explained by either the fineness or the gradation of a particular dust source. The effect of dusts from different types of aggregates on the compactibility of asphalt concrete mixtures needs to be more fully understood. The influence of the stiffening effect of baghouse fines on the fatigue and mechanical properties of asphalt paving mixtures also requires further study. There is some concern that the introduction of baghouse fines without a proper check on the design properties of the mix could possibly be a cause of tender mixes. (15)Tender mixes are characterized in one of two ways. One is that the asphalt mix is difficult to compact when normal construction techniques are used, which is usually manifested by shoving of the material under a steel wheel roller. The other type of tenderness relates to the slow setting of the asphalt mixture after placement, making it sensitive to wheel turning or concentrated loading, especially during periods of hot weather. (16) Some further investigation of this concern may be warranted. Kandahl, Prithvi, S. "Evaluation of Baghouse Fines in Bituminous Paving Mixtures." Proceedings of the Association of Asphalt Paving Technologists, Volume 50, 1981, pp. 150-210. Scrimsher, T. Baghouse Dust and Its Effect on Asphaltic Mixtures. California Department of Transportation, Research Report No. CA-DOT-TL-3140-1-76-50, Sacramento, California, 1976. Eik, J. M. and J. F. Shook. The Effect of Baghouse Fines on Asphalt Mixtures. Asphalt Institute, Research Report No. 78-3, College Park, Maryland, 1978. Ward, R. G. and J. J. McDougal. Bituminous Concrete Plant Dust Collection System - Effects of Using Recovered Dust in Paving Mix. West Virginia Department of Highways, Research Report No. FHWA/WV-79-003, Charleston, West Virginia, 1979. Gretz, R. H. Mineral Fines Effect on Asphalt Viscosity. Washington State Department of Transportation, Report No. 164, Olympia, Washington, 1980. American Association of State Highway and Transportation Officials, Standard Method of Test, "Mineral Filler for Bituminous Paving Mixtures," AASHTO Designation: M17-83, Part I Specifications, 14th Edition, 1986. Anderson, D. A. and J. P. Tarris. "Adding Dust Collector Fines to Asphalt Paving Mixtures." National Cooperative Highway Research Program, Report No. 252, Transportation Research Board, Washington, DC, December 1982. Lottman, R. P. "Predicting Moisture-Induced Damage to Asphaltic Concrete." National Cooperative Highway Research Program, Report No. 192, Transportation Research Board, Washington, DC, 1978. Anderson, David A. "Guidelines for the Use of Dust in Hot Mix Asphalt Concrete Mixtures." Proceedings of the Association of Asphalt Paving Technologists, Volume 56, 1987, pp. 492-516. ASTM D1075-94. "Standard Test Method for the Effect of Water on the Cohesion of Compacted Bituminous Mixtures." American Society for Testing and Materials,Annual Book of ASTM Standards, Volume 04.03, West Conshohocken, Pennsylvania. Anderson, David A. and Joseph P. Tarris. "Characterization and Specification of Baghouse Fines." Proceedings of the Association of Asphalt Paving Technologists, Volume 52, 1983, pp. 88-120. American Association of State Highway and Transportation Officials, Standard Method of Test, "Sampling Bituminous Paving Mixtures," AASHTO Designation: T168-82, Part II Tests, 14th Edition, 1986. ASTM D2726-96. "Standard Test Method for Bulk Specific Gravity and Density of Non-Absorptive Compacted Bituminous Mixtures," American Society for Testing and Materials, Annual Book of ASTM Standards, Section 04.03, West Conshohocken, Pennsylvania. Anderson, David A., Tarris, Joseph P., and J. Donald Brock. "Dust Collector Fines and Their Influence on Mixture Design." Proceedings of the Association of Asphalt Paving Technologists, Volume 51, 1982, pp. 353-397. Crawford, Campbell. "Tender Mixes. Probable Causes, Possible Remedies." National Asphalt Pavement Association, Quality Improvement Series No., 108-3/86, Riverdale, Maryland, 1987.